For the first three days of the week the Asian markets gained 0.7%, and the European markets gained 0.1%. The SPX has rallied from Friday’s close at 2596 to 2626 today, before closing at 2616. The US market has hit an inflection point. One that determines whether or not this rally is a B wave, or the Christmas low was the end of the bear market. We’re using five criteria to hopefully determine which is the most probable outcome: size of rally, NDX/NAZ and SPX/DOW wave patterns, rebound percentage from the low, and breadth rise from the low. First, this rally is the largest rally since the bear market began, a positive. Second, the NDX/NAZ look like they have done five waves up from the Christmas low, another positive. Third, the SPX/DOW look like they have done three waves up from the low, a negative so far. Fourth, the largest rebound for B waves, under similar conditions, in the past three decades has been 13%. The rally has already reached 12%, close to turning positive. Fifth, the maximum percentage rise in breath for a B wave has been 25%. Thus far breadth has risen 19%, a negative. Since we already have two positives, a third would raise the probabilities in favor a new bull market. A fourth would increase those probabilities, and a fifth would almost assure them. Short term support is at the 2594 and 2575 pivots, with resistance at the 2632 and 2656 pivots. Short term momentum ended the day with a negative divergence. Best to your Opex trading! You couldn’t be more wrong if you tried. The balance of trade account does include services and the use of bootlegged software clearly does decrease the revenue attributed to US trade account. Also, historically countries that habitually run trade deficits suffer a loss in the value of their currency and a concomitant reluctance by other countries to accept their money in exchange for goods and services. In the old days, they would have to ship gold to the other country to make up for deficit in their trade balance or the value of their currency would collapse to the point that they could not important anything at an affordable cost. So the status of the dollar as a reserve currency is very much threatened by a large negative current account balance. All the above is just International Economics 100A. it is incredible that the NYT would try to make such a preposterous claim as you say they have. On a related subject, the imposition of economic sanctions is driving China and Russia to find alternatives to the dollar as a medium of trade, which actually does threaten the status of the dollar as a reserve currency, If non-Russian Europe wants to reduce sanctions, how does it make sense for the US to want to continue or even increase them? After all, if the Russian Federation is such an imperialist threat, why do their immediate neighbors not feel more endangered. I have even heard that the US wants to impose sanctions on non-Russian Europe for building a natural gas pipeline from Russia. How insane is that? Let’s see how things play out from here and if we get a retest, how the A/D line looks at that point and whether the retest holds. I appreciate I’m not going to win anyone over on this as people hold their own beliefs on it already. Like I said, it’s not that I don’t see a relationship between the A/D and the market, it’s that I struggle to get to an actionable trading outcome using it that would be any better than just using price. Charts and ideas later….maybe on MLK day.. I am around, but writing……. I may sound like a broken record but why focus so much about shorting the U.S market. It’s the only instrument globally that is effectively ring fenced from going down so what is the point. Take China. Whenever there is a bit of positive news on China the U.S market goes up. What do the Chinese indices do at the same time. Absolutely nothing. Zero. Zilch. Don’t you think that if the Chinese news was really the news that investors cared about they would go the source and buy it. Of course they would. But it isn’t. It’s irrelevant. As soon as there is “positive” news on China it’s not investors buying the U.S market. It’s just the team that make sure the U.S market goes up, goes up. Sometimes, rarely, the U.S market will go down but as we saw off the high it’s done so quickly that traders that make it their life’s work to short it are too busy scratching their backsides they miss it anyway. What on earth is the point. If you start your investment career on the premise I will be long of flat the S&P and never short you won’t go far wrong. Every other asset class is free of these restrictions. Where have you made lots of money being short. DAX. CAC. FTSE. HSCEI. MIB NIKKEI SHCOMP OIL POUND EURO etc etc. Where have you made f all unless you picked the high and already it’s evaporating. U.S. The one market that, for whatever reason, is seen as a proxy for how great the country is. No other country cares about what the stock market is doing. Short them. You got off on many different tangents in your posts below in regards to the tariffs. No need to overcomplicate things. The U.S. is in a position to negotiate much better terms with China. We should take advantage of that and simply needed someone willing to go through the arduous task of doing so. Trump and his team need to hold fast. As long as they are firm the Chinese will relent, though it will likely take some months of pressure. ” China is in a position to negotiate much better terms with the U.S”. All the flag-wavers here will have retired or gone to trader-heaven. But the children and grandchildren will have to bear the fruits. Every action has an equal and opposite reaction. Whenever we deal with people and negotiate, we have to think of them as much as we think of ourselves. This fosters mutual respect, growth, trust. Any other way brings the usual consequences. [Chinese memories are long too,you know]. People talk about “loving all others”. What does that really mean if not the above? With all respect Dex, I think you dead wrong about China relenting. Xi is in power for very long time and has ultra long-term perspective. As such, there is every reason to think he will wait this out. He will “cooperate”, but his tactics will be to stall and he will only agree to promises that are hard to monitor and enforce. Overall, Xi’s strategy is/will be to wait out Trump’s term and hope to get an easier deal with next POTUS. So, if Trump wants to continue with hardball, Trade war will last much longer than months (it’s actually the harder corner for Trump to get out of – with the shutdown, at least has a “National Emergency” option). If Trump wants to end trade war, he will have to cave to Xi. As much as he might want to end trade war to lift the stock market, I am not sure his ego will allow a complete cave. He might make major compromises and not end up getting much and then declaring a victory, but I would not expect much more change than what we got with NAFTA 2.0. Lastly, I am somewhat amused by how the current market sentiment seems to be pricing in a significant lessening of trade/tariff concerns. Amazing how fast sentiment can shift from extreme fear to complacency. Just a matter of time before the egg cracks again. Have to think of China talks in Elliott Wave terms. Cycles, waves, degrees, …..
I’m surprised no one is seeing this latest rise as a very bearish rising wedge…and we are seriously close to the apex. Over next two -three months I’m targeting 1850 on the S&P before we see a decent rebound from 1850 to 2400 during Summer then all hell breaks loose to the downside this Fall. Good trading All! Hi, here’s some hope and respect for the potential bear…. This wave likely ended today at 2675 (right on those fibs and trendlines Lunker =) if not I cant see higher than 2717, that would make 5 longer than 3…. 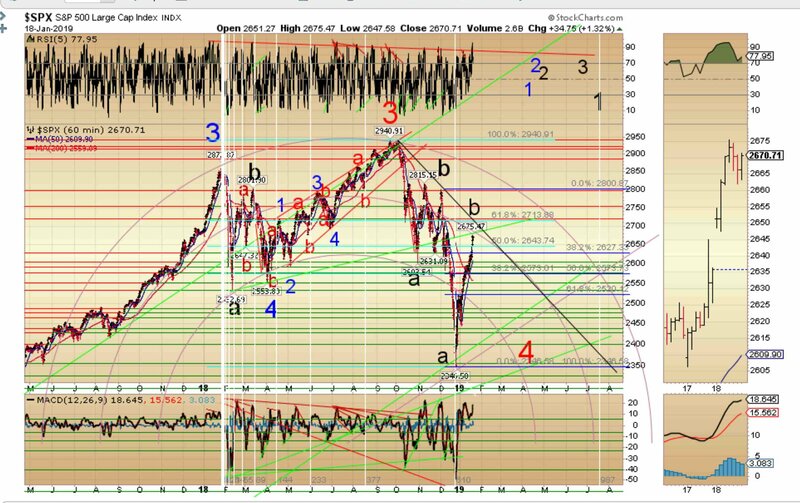 And 2713-17 is a good fib target for a 5 wave B thats about twice as long as the first one that looks impulsive up as B….. We’re so overbought at Bubble Highs here a wicked Bull Trap, gap down 2-300 scenario isn’t out of the question if were going down in C…. Welcome wallstpro, nice to have new blood (not necessarily in the literal sense). Now do you know 1850 has already been taken, discarded in favour of brighter lights, but remains as a ghost beckoning us to its darkness, but not while the children are singing…. So tony has a green 2. I shorted the close. Well let’s hope for a wave down next week and see what happens from there. I do feel much better about more short knowing aamichal has tripled down at 2642 though. If in minute 3 should go to 2723 where minute 3 is 1.618 of 1. We shall see what Tuesday brings. Should be an interesting week. Lots of bears out there still. Regardless of what the count is in all seriousness congrats to all bulls who bought and held. For what it’s worth, I don’t remember seeing aahMichael ever posting a long trade. Please stop posting this crap. Do you have any idea how many Americans each year die from illegal opioids? Most of that is carried over our southern borders. Are you in favor of that continuing ?? Tom, you are sadly mistaken and overly simplistic. The drugs that come in from Mexico wont be stopped by a Wall. If you’ve ever noticed, cocaine seizures at U.S. borders regularly measure in TONS, making it impractical to have individual migrants ferry it across. Drugs are smuggled into the U.S. via LEGAL PORTS OF ENTRY, which allow them to bring in high-value substances that are more easily hidden. All the cocaine, fentanyl and methamphetamine…. they cross through formal PORTS because theyre easier to hide in freight comp and assorted vehicles. A Wall isn’t going to stop illegal drugs from coming in. It’s terribly naïve to think otherwise. TC, please bar these 2 nitwits as well as about 10 others….we don’t care what they at what price they traded and how well they have done! This board was wonderful in the old days where you responded to every question or concern! Wonder how this will affects the markets?